Toyota is killing off Scion and transitioning the cars back under the Toyota badge. It’s been double checked by Jalopnik after they sent out a few emails and made some calls to Toyota for a confirmation. That’s right, there won’t be any more Scions after yours. All 2017 model year Scions (iM, iA, FR-S, and the C-HR concept model) will be rebadged as Toyotas except for the tC Coupe. If you want to get your hands on one, order soon because its production is set to end this August. As for servicing, just take your Scion to any of Toyota's service departments and they will continue to service your vehicle. Why did Toyota kill off Scion you ask? Because Scion sales have been slumping over the years. Sure they had a great run from 2005-2008 with yearly U.S. sales numbers of over 100,000 units and at the brand’s height in 2006, 173,034 units were sold in the U.S. alone. But the momentum didn’t last and the number dramatically decreased after 2008 to around half of what it used to be. 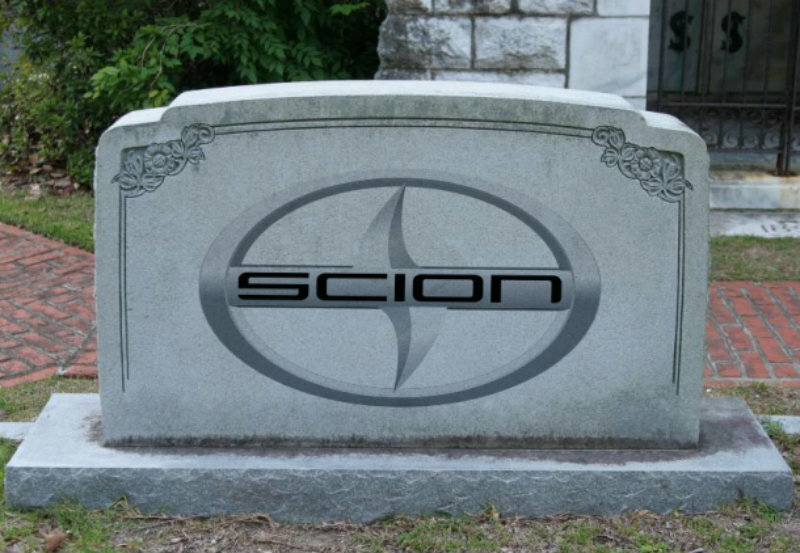 Even with the new iA and iM model release, Scion was still seeing a decline year after year. Maybe Toyota was already preparing for this with the iA when it was launched last year in Canada as a Toyota Yaris. What we do know is that Toyota achieved what it originally set out to do with Scion, attract younger buyers and use the Scion badge to fast track and test out ideas in the real world. In all honesty, I am not too upset by this. The pure pricing was kind of cool and refreshing purchase experience (I have had 2 friends buy Scions while I was with them, plus both my wife and I have both purchased one). It provided some of our better dealership experiences. Same here. Woulda bought a Mazda 2 were it available. I'm interested to see what a Yaris specced out with all the options the iA has will end up costing. Now it will make sense to rebadge future Toyota vehicles with Scion badges. It will be a vintage throwback type thing. A rarity. "Rare numbers matching manual transmission 2016 Scion iA, only year of production!" I'm all right with it, too. The Scion dealer is about 400 miles west of me in Denver. But Lewis Toyota is right in town here! So it will be a lot more practical if I want to buy an iA of my own in the next couple of years. And Toyota will not just dump current Scion dealers, which is really cool. Aren't all Scion dealers connected to Toyota dealerships? Mountain States Scion in Denver looks ta be standalone but I can head over to their website and see if I can learn if there is a connection to a Toyota dealer. IIRC it's a separate Scion dealer. I'm actually surprised they would do that at all, only makes sense to pair it with a toyota dealer.